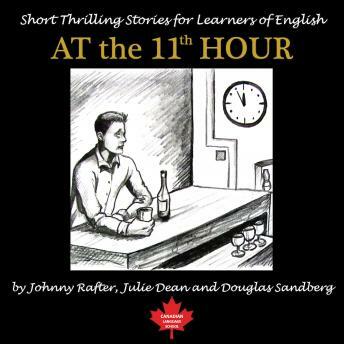 "The Canadian Language School presents - At the 11th Hour. At the 11th Hour is designed especially for intermediate to advanced learners of English as a Second Language. It contains 21 thrilling stories which have plot twists and surprise endings. It was written, developed, and tested by English teachers with many years of classroom experience. The audio book brings the stories to life with male and female voices, music and sound effects. A woman from Germany receives a letter from the United States saying that she has inherited all the assets of her deceased uncle. She is excited and can't wait to become rich. But a big surprise awaits her across the Atlantic Ocean. Two terrorists decide to steal a truck on the street in the middle of the night. They have no idea that something inside is waiting for them. If only they knew. A young woman who hates beggars finds herself on the street as a beggar herself. Will the experience change her? And much more. What happens next? A mystery, the unexpected, the surprise will reveal itself in each story. Learning is fun and easy when you can't wait to find out what happens next while acquiring new vocabulary and expressions. This title comes with a workbook.